TÁNAISTE AND MINISTER for Foreign Affairs Simon Coveney has compared the British government’s latest negotiating tactic to saying ”unless you give me what I want I’m jumping out the window”. Last night, 317 MPs voted in favour of an amendment that proposes to remove the backstop and replace it was unspecified “alternative arrangements”, in what was the first indication that the House of Commons had a majority for some kind of Brexit deal. The EU and Irish government responded by saying that the Withdrawal Agreement wouldn’t be renegotiated. German Foreign Minister Heiko Maas also tweeted out to say that “on the backstop, Germany and the entire Union are firmly on Ireland’s side. We will not allow Ireland to be isolated on this issue”. Meanwhile, former Brexit Secretary Dominic Raab told a British committee on Northern Ireland this morning that it would be possible to renegotiate the backstop if they found “a ladder for the Irish government to climb down”. 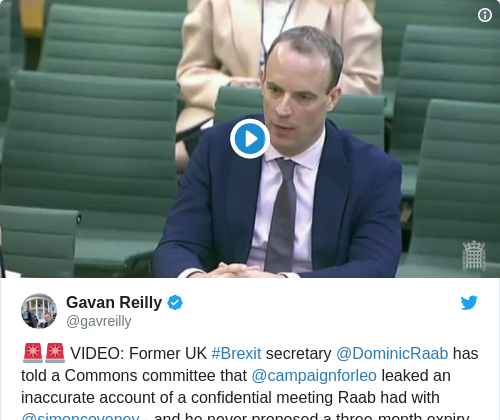 Raab also accused the Taoiseach of leaking inaccurate information to the media about a meeting he and Coveney had about the backstop. Raab said that he and Coveney had agreed to keep the meeting private, and that he never proposed a three-month expiry to the backstop. The Irish government took such a trenchant line on the backstop, such a very political line on that, I think we do need to understand that we probably need to work with our Irish friends that not only deals with the practical operational issues, but is politically acceptable to them. The Irish government are in a very difficult position now, and that’s mainly because of the particularly strong political position taken by the Taoiseach. There is less than 60 days to go before the UK leaves the EU on 29 March. 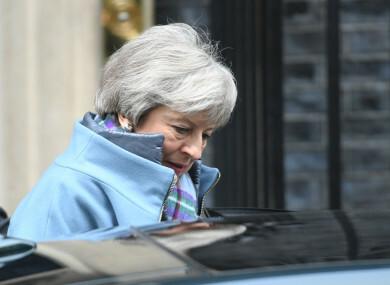 Last night, Theresa May told the House of Commons that the vote to replace the backstop would be put to the EU, to try to get a Brexit agreement before that date. If that doesn’t happen, the UK will leave with no deal, which is the worst case scenario for the UK, the EU and Ireland. In an impassioned speech given today at the Institute of International and European Affairs, Coveney said that the idea of alternative arrangements had already been considered as part of the two-year Brexit negotiations. He added that it was “highly unfortunate” that there was only one party from Northern Ireland that represents a minority view on Brexit taking its seats in Westminster. He added that although he respects the DUP, which is in government with Theresa May’s Tories and who oppose the backstop, that any outcome for Northern Ireland that has “winners and losers” would negatively impact the Peace Process. What would this new backstop look like? Speaking about the backstop, Raab said that he thought ‘the sunset clause’, or an exit clause was “an eminently sensible proposal”. There’s three ways of dealing with it: you either change the entire paradigm from the start, so you don’t have a legislative alignment approach, you have an operation- and technology-based approach, or you limit through time or an exit mechanism, the legislative alignment application. “And what was clear to me, was that in Dublin – I don’t want to get into their domestic politics – but politically, they’re taking a very firm line on a deadline. And therefore it seemed to me, in terms of coming to a solution that worked for all sides, a more pragmatic approach was an exit mechanism. And that was discussed at great length with all the relative Cabinet members particularly the Attorney General. He said that as late as October, based on his discussions with the Irish government, that option of an exit mechanism was “probably still in play”. “I think the crucial thing to change the backstop is to change from the high legistered alignment paradigm of avoiding a hard border, to moving to a technologically decentralised, process-driven approach. You say, and I’d probably agree with you, that there are no changes to the border as it is at the moment, that the changes will be technological that they will be done by drones, done by paperwork, or done by work beforehand? Because that’s what Stephen (sic) Coveney says, they don’t want a hard border except for that rag-tag army they have. But in relation to a hard border, that’s what it will be – a soft border? “It can be done, the question now is whether there is a political choice,” he said. Email “Coveney: London's latest tactic is like saying 'give me what I want or I'll jump out the window'”. Feedback on “Coveney: London's latest tactic is like saying 'give me what I want or I'll jump out the window'”.